Polybit Polyscreed PU by Henkel ... multiple applications. Henkel Polybit Industries has launched Polyscreed PU, a heavy duty polyurethane-based flooring system. 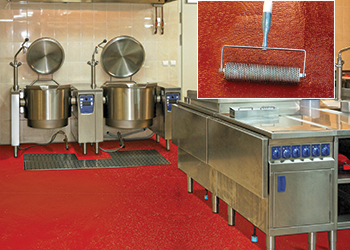 With its four water based, chemical resistant components, Polybit Polyscreed PU builds a strong, professional antimicrobial flooring system that can handle all challenges and meet the highest hygiene standards in food and beverage production units, laboratories, chemical plants, freezer rooms or meat processing plants, according to Jayanta Majumdar, head of marketing, Henkel Polybit. Offering the durability and strengths that usually are associated with polyurethane resins, Polybit Polyscreed PU is a non-dusty, easy to clean finish. With matt appearance and four colour options, the system not only meets high anti-slip properties but at the same time also responds to the most common design and interior fitting requirements. Polybit is one of Henkel’s most trusted brands in the GCC region. Henkel and its brands take pride in their contribution to the construction or improvement of some of the most famous buildings in world, such as the iconic Burj Khalifa and Burj Al Arab in the UAE; Wembley Stadium in England; Qinling Zhongnanshan tunnel in China; or Kalinin Nuclear Power Station in Russia, to name a few. Backed by 130 years of experience, Henkel, with its over 50,000 employees around the globe, builds leading brands and technologies that make people’s lives easier, better and more beautiful every day, he says.